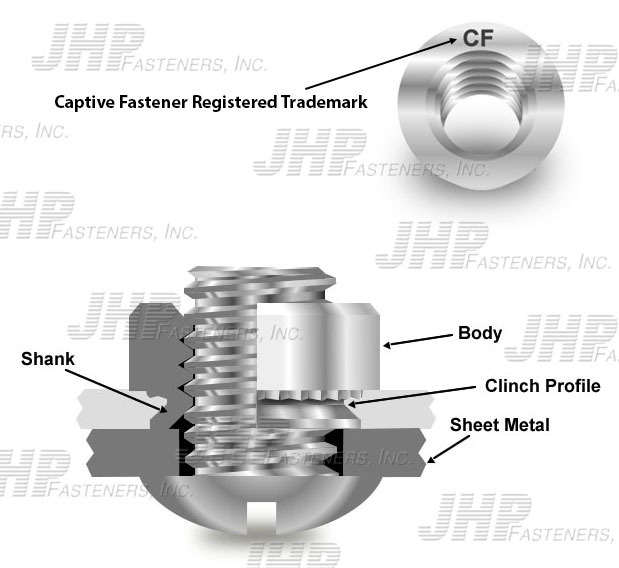 JHP Fasteners maintains a larger inventory of self clinching nuts than most other fastener suppliers in the industry. We offer self clinching nuts with both inch and metric threads, with steel, stainless steel, and aluminum varieties available. All three materials appropriate for nearly any environment. These self clinching fasteners can be installed during the initial manufacturing stages of your product or during final assembly. When selecting self clinching nuts for your application, several factors should be considered: The ductility and thickness of the metal framework in which they will be installed, and the function the nut is expected to perform. Self clinching nuts are frequently used in applications where the sheet metal framework is too thin to tap. Once installed, these self clinching fasteners become permanent fixtures in the metal chassis. They are reusable as well, allowing for continued use over time. The metal framework must be softer and more ductile than the metal used to produce the fastener—through a cold flow process, the metal wraps around the clinch profile of the nut, securing it in place. Punched holes must be sized correctly prior to installation to ensure that the self clinching nuts stay in place. The serrated sections of self clinching nuts prevent the fasteners from rotating when torque is applied. Captive Fastener has been our choice for self clinching nuts and other self clinching fasteners for over 25 years. In that time, Captive’s products have repeatedly proven themselves to be as good, or better than the similar, but better known, PEM® nuts and fasteners. For size, form, function, and durability, Captive Fastener’s self clinching nuts are all but identical to PEM® nuts. But when it comes to quality and value for the money, Captive is the far better choice. Replace your PEM® nuts with Captive’s self clinching nuts and we’re sure that you’ll agree 100%. 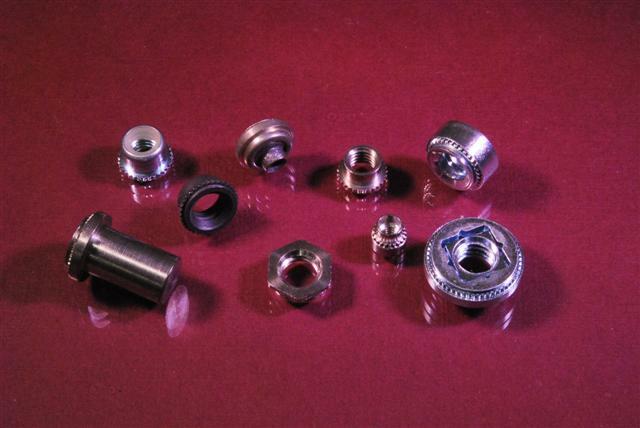 All self clinching nuts are available in inch and metric sizes. We offer self clinching nuts in a wide variety of sizes, weights, functions, and materials, so choosing the correct one for your application is critical. The expert team at JHP is available to help you find the right self clinching nuts for your specific application. JHP Fasteners is a global fastener supplier, providing inch and metric self clinching fasteners—including nuts, studs, and standoffs—for customers around the world. Contact us for more information on any of our products and services. * “PEM” is a registered trademark of Penn Engineering®. JHP Fasteners is not an authorized distributor for Penn Engineering® . We are an authorized distributor for Captive Fastener Corporation. Captive Fastener Corporation parts are equivalent to Penn Engineering® part numbers in form, fit & function.